The Marble Lane Bridge (09C0001) is a 285 ft long four span steel truss that includes a 100 ft long Pratt through truss span. The bridge is supported by large diameter steel pile extensions across the Middle Fork of the Feather River Overflow, which are several wandering streams near the headwaters of the river. The bridge was built in 1908 by the Canton Bridge Company in Ohio. The Marble Lane Bridge is located in the Sierra Valley, an enormous meadow surrounded by mountains. You can see and hear long Union Pacific freight trains crossing over Beckwourth Pass just a little north of the bridge. This is considered one of the most beautiful and unspoiled areas of California. This is a single lane bridge with an asphalt covered timber deck. The steel members came from the Cambria Steel Company of Johnstown, Pennsylvania. It's interesting how a bridge with steel from Pennsylvania and designers from Ohio got built in a high plateau in California. 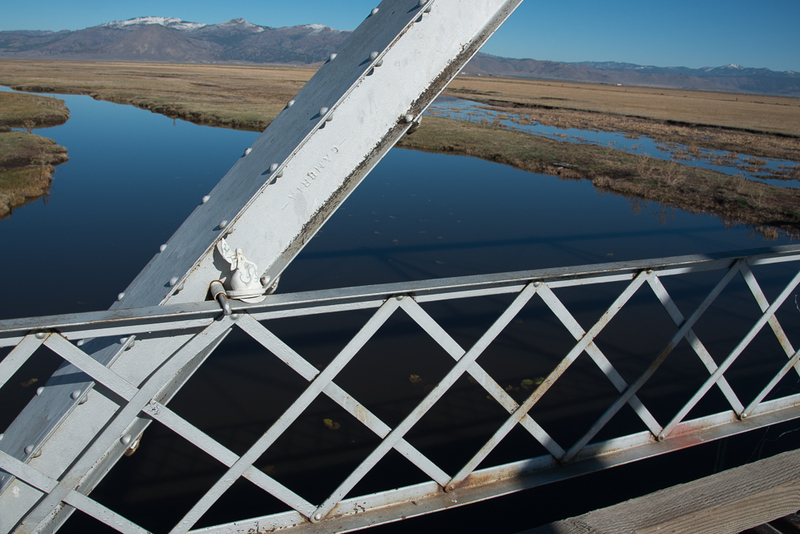 Since the bridge was completed in 1908, perhaps it was built to carry equipment for the nearby railroad that was being built over Beckwourth Pass. Plumas County, California Bridges: Marble Lane Bridge across the Middle Fork of the Feather River Overflow by Mark Yashinsky is licensed under a Creative Commons Attribution-NonCommercial-NoDerivatives 4.0 International License.